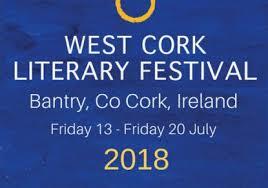 Three of our current MA students – Anna Sheehan, Dee Collins and Diarmuid Hickey – read at the annual UCC writers’ showcase event at the West Cork literary festival at Bantry last week. The reading, introduced by Director of Creative Writing Dr Eibhear Walshe, is now in its third year and features the work of our students chosen by competition, as well as providing an informal information session on the MA to those interested in applying. In addition to the three readers, John Rodgers, a student on the 2017/18 MA, was remembered with a reading of his work by 2017/18 writer-in-residence Tom Morris. John died in June after a short illness. This entry was posted in News on July 24, 2018 by Mary Morrissy.